Find out what’s inside a volcano. Fun facts, experiments, geology and history. The Earth’s crust, lava flow, and even geysers suddenly make sense with this visual reference that explains it all by uncovering volcanoes layer by layer. 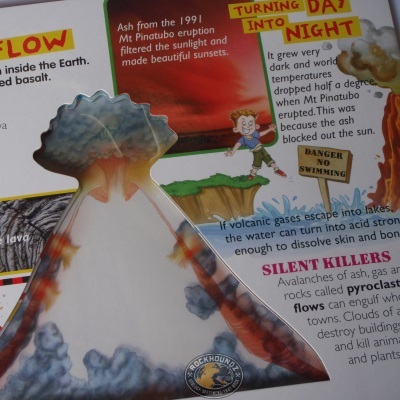 From types of lava to exploratory robots, this book looks into it all! Volcano X Ray 2010, 12 pp. Not recommended for under 3 years of age.